Are Americans Driving Less Because They’re Working Less? Everyone’s trying to figure out why, after decades of consistent growth, the amount Americans drive is leveling off and even declining. The decline started during the recession, to be sure, but was more dramatic than in previous recessions. 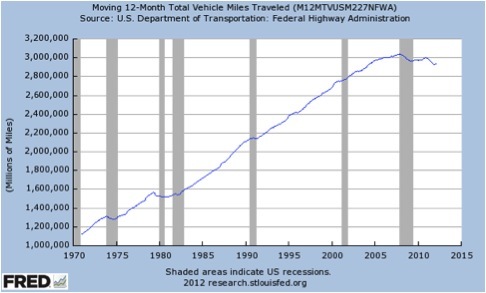 As the economy began to get back on its feet, vehicle miles traveled (VMT) just barely ticked upward — and then fell again. High gas prices probably have something to do with it. Young people embracing cities over suburban living — and valuing smartphones more than cars — might have something to do with it. It could be peak car — the theory that continued growth in driving simply can’t go on forever. The two lines — GDP and VMT — track pretty closely together until just now. 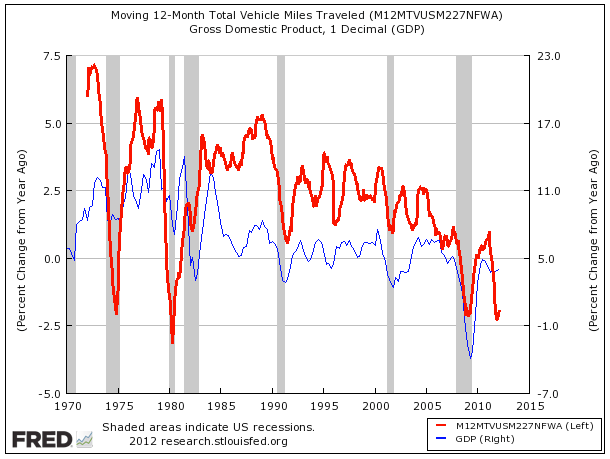 The rate of change in GDP more or less holds steady, but the VMT line takes a major dip. 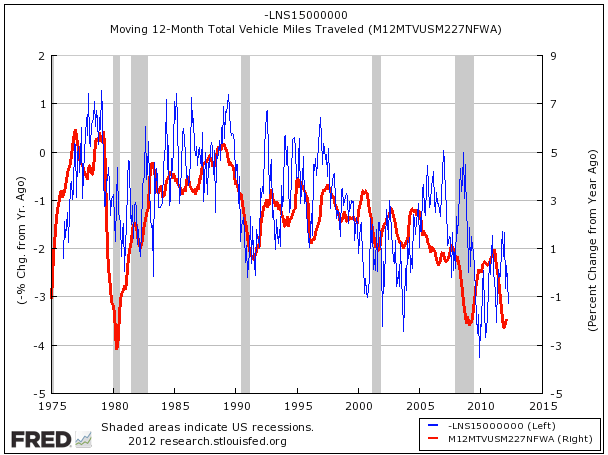 This was what Weisenthal found so unbelievable: that the reduction in VMT could be decoupled from economic fluctuations. But then he remembered something else that’s seemingly decoupled from GDP these days: employment. The graph shows a rough correlation between growth in the number of people out of the workforce and decline in VMT. Indeed, this has been called a “jobless recovery” so the growth in people commuting probably has not been as strong as the rise in GDP. Streetsblog’s Angie Schmitt tackled this issue in a post two months ago and concluded that VMT was dropping despite job growth, and in terms of absolute numbers, that seems to be true. The chart above adds complexity to the picture but doesn’t discount Angie’s conclusion. High gas prices are still causing people to leave the car in the garage and take transit. Decline in exurban growth and strengthening preferences for walkable development mean trips get shorter and can even be taken without the use of the automobile. It remains to be seen what will happen when or if employment fully bounces back, but there’s reason to believe the downward trend in miles driven could have legs. You’ll probably see VMT increase when construction activity increases. In the short-run and for those who still have jobs. In the long-run they will switch to more fuel efficient vehicles unless transit really wows them, and transit doesn’t do much of that in America. And the unemployment rate is decreasing because people have given up looking for work. Not only are they not commuting to a job, they are not even travelling to job interviews. Besides the possibility of young people might be “valuing smartphones more than cars”, smartphones may be contributing to this by making a long bus ride more tolerable. One can be productive or entertained on the way to work. higher fertility rates among immigrants in walkable, transit-server inner city and suburb areas would definitely create this effect.